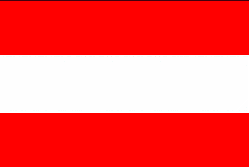 The Austrian Flag has three equal horizontal bands of red (top), white, and red. 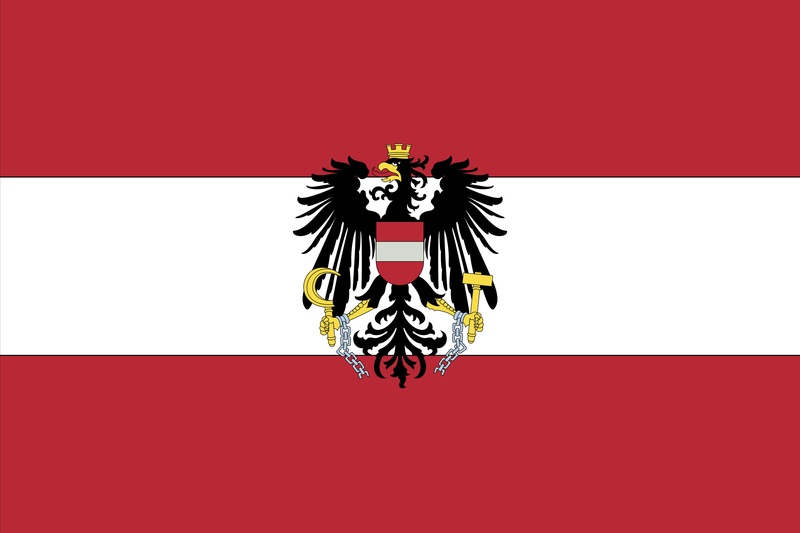 The flag was adopted by Friedrich II., der Streitbare, the last Babenberg as Duke of Austria in the 13th century. According to legend, Duke Leopold V. of Austria (1157-1194) was involved in a fierce battle during the Crusades. After the battle of Acre his white battledress was completely drenched in blood. When he removed his belt the cloth underneath was untouched by the blood. So taken was he by the singular sight he adopted the colours and scheme as his banner. In reality it was Duke Frederick II. of Austria (1210-1246) who sought greater independence from the Roman Emperor. To this end he had a new coat of arms designed - a red field with a silver fess. The oldest source for the new flag is contained in a seal kept in the monastery of Lilienfeld (Lower Austria) dated 30 November 1230. Together with the Danish flag the Austrian flag is said to be among the oldest national flag designs in the world. This is a list of margraves, dukes, archdukes, and emperors of Austria. Austria became one of the marches (the Ostmark) of the Holy Roman Empire after the Battle of Lechfeld in 955, and was given a margrave around 960. Until 1278 Austria was ruled by the Babenberg family. In 1278 the duchy passed to the Habsburg dynasty, who were often also Holy Roman Emperors. After 1359 the dukes were archdukes, most of whom were also Holy Roman Emperors. After the Holy Roman Empire was partitioned in 1806 the Austrian Empire was created from its remnants. Charles III was expelled after World War I and the empire was abolished.